After hiking Angels Landing, Julia and I continued to explore Zion National Park by making our way to the Zion Lodge and the Emerald Pools Trailhead. The Emerald Pools are on the West side of Zion Canyon, which meant we’d be hiking in the cool shade for the entirety of this trail. There are three Emerald Pools, Lower, Middle, and Upper. This hike is a 2 mile out-and-back roundtrip with 350ft of elevation gain. 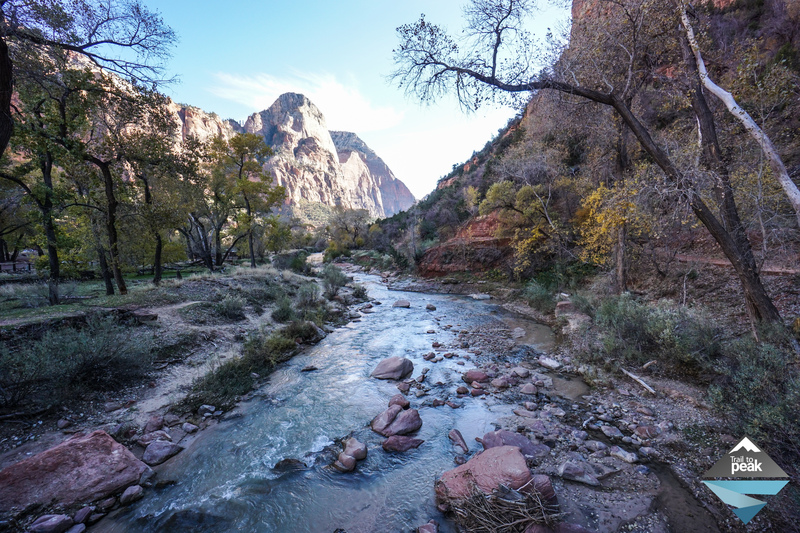 Leaving Zion Lodge, the trail crosses the Virgin River via a bridge and begins towards Lower Emerald Pool with a .6 miles stretch that is on a paved walkway. The majority of this trail is flat, with only a few short uphill patches, before descending below a waterfall and hanging garden. It was quite amazing to feel the scale and presence of the sandstone walls that rose like an amphitheater as we approached the Lower Emerald Pool. With water falling and dripping down the walls, I was enchanted by the peaceful and meditative sound only found in these nature environments. It was a fairly cool day with temperatures in the lower 40s. A small stretch of trail requires that you walk underneath the fall. Although it was cold, I really enjoyed feeling the spray of cold water that fell upon me. The trail begins a very gentle ascent after leaving Lower Emerald Pool to Middle Emerald Pool. The water that was falling down the sandstone walls in the Lower Pool, comes from the Middle Pool up above. It’s only a few short steps up on the trail to reach the Middle Pool. There is a trail junction at this section that gives you two options. You can continue on towards the Upper Emerald Pool or head back towards the Grotto (The Angels Landing Trailhead). The trail towards the Grotto allows for a nice loop hike if you’re trying to avoid and out and back. The stretch of trail from the Middle Pool to the Upper Pool has the most uphill hiking on this hike. It’s hardly substantial though, and can be completed by anyone with even a moderate level of fitness. We saw a lot of children of all ages enjoying this hike. After reaching the Upper Emerald Pool, we made our way back down on the same stretch of trail to reach the Zion Lodge. The afternoon fall colors were really starting to shine, which was nice given the amount of darkness and shade we had just hiked through. We spent a little more time exploring the park before making our way to the visitor center to buy some patches and stickers, and eventually left just before sundown. After driving as much as we had to get to Zion, we decided to stay as close to the park as we could manage. The town of Springdale is the support town for Zion National Park, just a few miles outside of the park gates. Thanks to this being the off season, we were able to get a pretty decent hotel right in the heart of Springdale. I’m a very healthy eater by nature and tend to follow a very strict diet when I’m home. That all goes out of the window while I’m travelling though, as I like to eat out and enjoy as much fat, salt, and calorie rich meals as I can manage. For dinner, we ate at a place called Oscar’s Cafe, which turned out to be a real gem. I would highly recommend it if you’re stopping through Springdale on a visit to Zion National Park. After dinner, we made our way back to the hotel, and relaxed for a bit before planning our day ahead. In the morning, we would be getting and early start and driving to Bryce Canyon to take in the magnificent hoodoos! I love Zion, my favorite national park. Thanks, Rechito!! It’s an absolutely gorgeous park! Thanks! Both Angels and Emerald Pools were incredible Fall hikes. I’d like to go back and see them in the Spring as well! i plan on going to zion national park next year, so this is a great little post for me to get a feel for it! i plan on hiking through the narrows. Wow, breathtaking! Fascinating landscape forms! Okay, this is now on my bucket list. What spectacular vistas and getting up close and personal with that canyon. Plus for someone like me it’s fitness-compatible. Thanks for posting! Thanks for reading! This is one of those great parks, that has a little something for everyone! Looks absolutely stunning! The walking sounds wonderful and so does the food! This is the hike I did end up doing. All these photos are familiar to me. Thanks for sharing. I might dig up my old photos now and reminisce! Thanks for reading! I’d be interested to see photos from other seasons and years, as I hear the flow of water was unusually low when we visited. Absolutely beautiful! Haven’t been there yet but definitely on the list. Thanks! It’s an incredible park. I’d highly recommend it! Ah, your pictures are stunning! I wish we’d gotten to see the Emerald Pools on our visit to Zion. Your pictures are unforgettable. Thank you! There is so much to see at Zion. We’re hoping to return to explore the Narrows. Oh, I loved the Narrows. We went during summer in 2014 and it was easily my favorite hike ever. I hope you get to return too! Such a nice place ! I love it so much ! Zion is one of the best park ever ! I did narrows and angel’s landing, awesome trails ! Nice job !